Malaria is endemic in Northern Nigeria, in both urban and rural areas. Chronic malaria degrades a person’s health, and can cause death, especially for the very young and the elderly. A malaria episode is a serious illness, with chills, fever, and severe aches, and in some cases can last for weeks, with multiple symptom cycles. An NFW partner in the North has a medical ministry in the villages, using medically-trained members of his ministry team. They focus on prevention as well as treatment. One of the ways they do this is by buying mosquito nets that are impregnated with a special insecticide, and distributing them to those with chronic malaria. 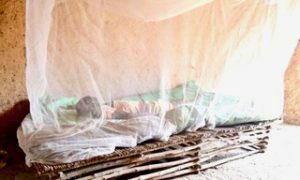 These nets are very effective in preventing mosquito bites during the night, which is when the insects are most active, and give a chance to the persons affected to regain their health and be cured of malaria, with the help of medications. NFW has provided funds to purchase 600 of these special nets, which will be distributed in 2019.